Yao Ming makes Napa Valley cabernet sauvignon and hosts wine lovers at The Yao Family Wines tasting room in St. Helena, California. Well, to date it is difficult to find the wines of China here. But the question still remains, what to drink with that Kung Pao Chicken? Going back to last week’s column on Sauvignon Blanc, I have had a lot of it lately and near the top of the list is this balanced crisp and clean palate pleaser. I have not had the opportunity to pour it with a wok full of goodness yet , but my guess is it would be a pleasure. When we think of wine countries, France and Italy may be the first to come to mind. But in the new age it is not a stretch to suggest that the most important wine nation in the world may well be China. When you consider the size of China’s emerging consumer demand, the exponential growth in vineyard plantings in new wine regions and the purchase of key winery properties around the world, there is little doubt that China will play a significant role in the future of wine. So is that a good thing? Well, it depends on who you are. If you are a Western Australian wine exporter, it is a very good thing indeed. Last year, exports of Australian wine saw a 10 percent increase with much of that growth attributable to the Chinese marketplace. This at a time when the U.S. market is starting to re-emerge after a long downturn. Daily, there are deals being made between Aussie winemakers and Chinese business alliances that call for both sales and partnerships in Chinese-based vineyards. This past spring, in London at VinExpo, predictions were made that, if current trends continued, China would be on pace to become be the world’s No. 2 wine market in 36 months. By 2020, the country is expected to trail just the United States in overall sales volumes for wine and become the leader in the consumption of non-sparkling wines. This is a country that ranks 36th in per capita consumption. Of course, there is a lot of capita in China. Nearly 1 of every 5 people on the planet live in China. According to the latest United Nations estimates, as of July 27, China’s population was 1.39 billion people, give or take a birth or two. That is a lot of drinkers and satiating their ever-growing thirst for wine will take some doing. If you are grower or winemaker, you have to be pretty happy about the numbers. That is, if you have the capacity and infrastructure to sell and export your product to the Chinese market. The growing affinity for wine by the Chinese also is a good thing if you happen to be an “agent immobilier,” or real estate agent, in France, particularly one who represents the wine-growing Chateauxs of Bordeaux. Last month, a wine estate and 15th-century chateau, called Chateau Fauchey, in Cadillac Cotes de Bordeaux, sold to a group of Chinese investors called Profitsun Holdings. Their strategy for the property calls for the production of Bordeaux-branded wines that can be brought back to high-end luxury clubs and hotels they own in China. This is just the latest in a continuing string of purchases made over the past decade. Over 100 properties in Bordeaux, many of them on the fringes of the grand cru vineyards but nonetheless outstanding properties, have been sold to Chinese investors. Many not only see the purchases as good investments, but also enjoy the prestige associated with owning the spectacularly beautiful properties. But the real growth area for the future for China is in wines that are grown and produced within its borders. China is now the No. 2 nation in the world, trailing just Spain in terms of area planted to vines. Though it still lags behind Spain, Italy, France and the U.S. in terms of wine production, it is just a matter of time before their overall production ramps up. In an indication of just how serious the Chinese wine industry is about their future, they have begun the process of “classification” of their wines. This is much like the way that the United States uses the AVA system, or France, the AOC, to designate certain wines and certain regions as being of higher quality. An understandable classification system can allow consumers to differentiate between various wines and also establish tiers of pricing for those wines designated as superior. Perhaps the most famous face and name in Chinese wine belongs to a man who stands tall in any vineyard. Yao Ming, who found fortune and fame as an NBA star for eight years, has created a Napa Valley wine label, called Yao Family Wines, that focuses on the production of cabernet sauvignon from fruit sourced in a series of Napa vineyards. Ming’s success on the court was unprecedented for a Chinese-born hoopster, and now his success in wines is also approaching that pinnacle. Highly regarded and always sold out, about a third of the wineries’ production goes to China. 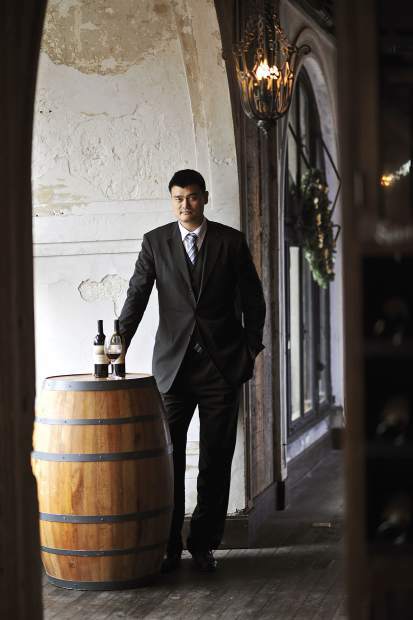 Yao Ming may one day be regarded as the Chinese Mondavi or Antinori.